A petition launched Friday asks the Electronic Frontier Foundation (EFF) to investigate Microsoft's aggressive moves to convince and cajole users into upgrading to Windows 10. The request was launched on Change.org, a popular online petition website, and by early Monday had garnered more than 470 signatures. While Kleinpaste threw in a kitchen sink's worth of complaints -- not just about the upgrade process but also Windows 10's telemetry settings and Windows Store policies -- the bulk of those signing the petition focused on Microsoft's attempts to get users to upgrade. "It's like someone changing your underwear while you sleep!" said wag Brian Tatman on Monday. "Microsoft 'encouragement' to GWX went WAY too far," added Alan Pugh. "A PC at our remote site got upgraded without my consent which broke the network connection, meaning that the computer is now useless to me." "The number of clients we've had to assist in recovering from surprise updates has only increased over the last 6 months, and while it certainly has provided a certain amount of job security, the cost to individual users across the world has got to be staggering," added James Allerd today. 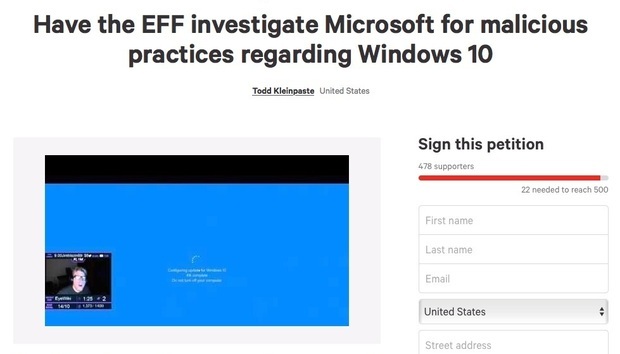 "Please sign this petition to draw the EFF's attention and ask them to investigate Microsoft for unethical business practices," wrote Kleinpaste, the petition's organizer. The EFF was not immediately available for comment. Even before Windows 10's release in July 2015, Microsoft had been taking unprecedented steps to boost the new operating system's uptake, ranging from offering a free upgrade to planting the Get Windows 10 (GWX) app on millions of Windows 7 and 8.1 systems. The GWX app initially let customers "reserve" a copy of the upgrade, but has mutated since then to pre-load the necessary files on PCs, replace itself if deleted, and most recently, to schedule the upgrade itself. That scheduling has been the latest Microsoft maneuver to raise customers' hackles, notably because the notification assumes user approval when someone clicks the red "X" to close the frame. That interpretation runs counter to decades of practice and Microsoft's own design guidelines. Because the free upgrade offer will expire on July 29, many expect that Microsoft will stop dunning customers by disabling the GWX apps. The company, however, has declined to confirm that.